It has now been 11 days since we've gone sugar free, and by sugar free I mean refined sugars (white and brown) and by we I mean mostly Christian, Baby Maria and I. Enzo is trying his best. I'll talk more about that in another post. When I tell people about our sugar free month the first thing I get asked is, "are you craving sugar?" and my answer is "no." But yes, I'm just as surprised by my answer as maybe you are. However, I have been craving baking. So yesterday I spent all morning researching recipes, experimenting, and finally coming up with a sugar free cake I was satisfied with. 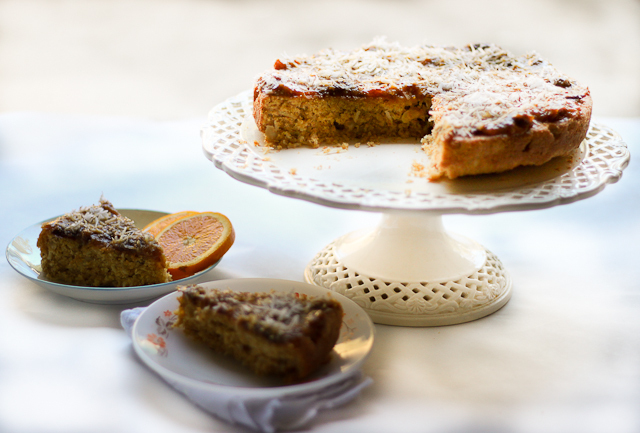 This polenta cake has a kiss of sweetness that comes from the fresh orange juice and coconut. And also from a prune sauce I made to go on top. I'm also smitten with the crumbly texture of this cake. It's pretty perfect with yogurt. While the cake was in the oven the smell of sweet corn reminded me so much of my grandmother, Vo Aurea. It may be because she made a lot of polenta and corn bread when I was growing up, or it may be just the saudade, a deep longing, for her company. She would like this cake. She would be proud of me for using prunes, but mostly she would be proud of me for successfully cracking the coconut open without letting the coconut milk go to waste (total luck). She would nag me though, about quitting sugar. Because really, it's pretty silly to give up on sugar and without hesitation if she brought me her passion fruit mousse this very second I would mostly likely break. But something tangible has happened during these past 10 days. If you didn't believe in sugar crash let me just tell you right now that it is real. The more I ate sugar the more I craved sugar, and the more I ate sugar the more irritated and tired I felt. Yet, in order to get a boost of energy I would resort to a spoonful of sweetened condensed milk, or a piece of chocolate hidden in the drawer below the microwave. Remember the no brainer brownie recipe I shared a while back? I used to make that recipe a couple times a week and eat most of it. I would eat sweets to get me through the day without realizing that the reason I wasn't getting through the day was because of sweets. I was having crazy mood swings specially at night after eating one, two, three, sometimes four pieces of brownie, or cake, or cookies, or whatever I could find that would satisfy my sugar craving. Only it wouldn't ever satisfy it. It would just make me want more. So now I pretty much stopped the night time routine of constantly snacking and if I really do feel the need to munch I'll go for coconut, nuts, or fruit. Real food brings real satisfaction. I hope you're reading this keeping in mind that this is particular to Damaris. I am not making any universal claims about sugar. I've asked Christian is he's felt any different and he said "no." Granted this comes from a guy who can drink as much milk as he wants, who helped clean off a monkey and then proceeded to eat it for goodness sakes. Christian is the guy who travled to the Amazon, has lived in very poor communities in Brazil, and would always drink water from the tap. He never got sick. I am not Christian. I can't tolerate milk. I've had various issues with water contamination. And personally I feel much better when I don't eat sugar. and using them as substitute for white sugar when I bake. 1 matured coconut. Shred 2 cups coconut. 1 for the batter and 1 for the topping, also save the coconut water for the topping. Preheat the oven to 350 and prepare a 9-inch round cake pan with parchment paper. Butter the inside of the pan then line the bottom with parchment paper. Butter the paper, then dust the pan with whole wheat flour. Using a mixer, beat the butter on high speed until light and fluffy, 1-2 minutes. Slowly beat in the coconut and the eggs. Make sure to beat in the eggs one at a time, fully incorporating each one before adding the next. Then add the orange juice and the orange blossom water and mix on medium speed for 2 minutes. In a medium bowl whisk the corm meal, flour, baking powder, salt, cream of tartar, cinnamon and nutmeg. 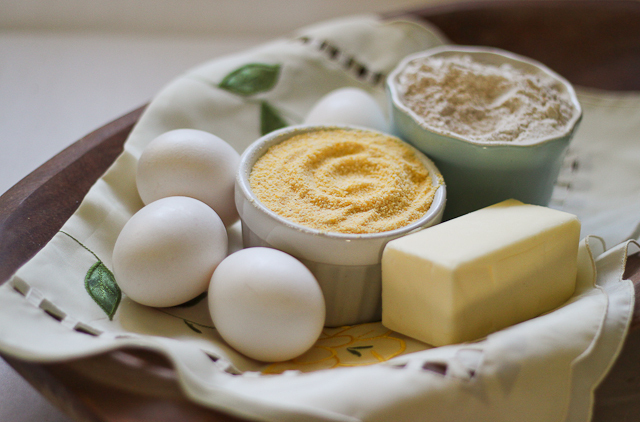 Add the dry ingredients to the batter and mix on medium speed until the dry ingredients are fully incorporated in to the batter. Pour and spread out the batter in the cake pan. Tap the cake pan to remove any air bubles. Bake until a toothpick, inserted in the center comes out clean about 30-35 minutes. While the cake is baking prepare your topping. In a small sauce pan bring the orange juice and coconut water to a boil. Add the prunes and turn the heat down to medium-low for 30 minutes. Stir occasionally and you'll start noticing the prunes coming apart and the sauce thickening. When the cake is done baking let it cool down for 15 minutes at room temperature. Put the topping sauce in the refrigerator during that time so that it also cools down. When the cake and the topping sauce is no longer hot invert the cake onto a cooling rack and carefully turn the cake right side up. 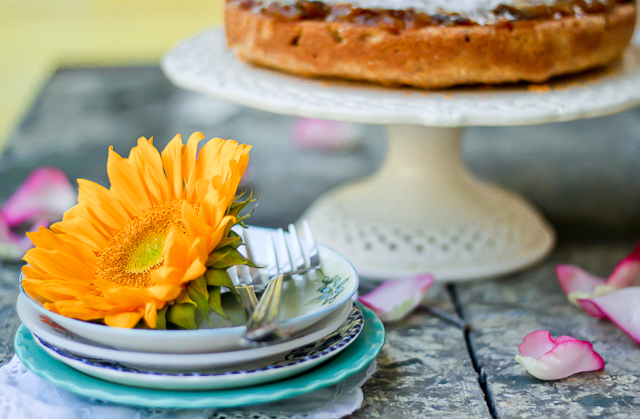 Transfer the cake to a cake stand or a large round dish. Pour the sauce on top of the cake and carefully spread it evenly. 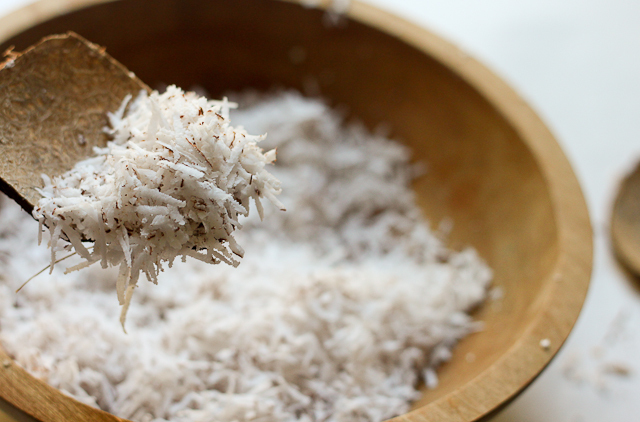 Sprinkle shredded coconut on top and garnish with flowers or orange slices. 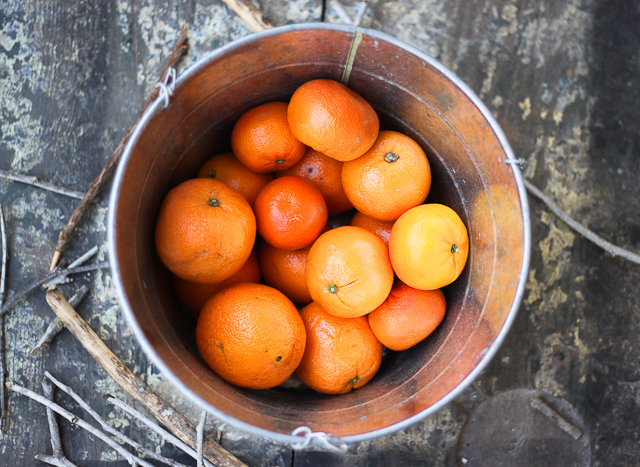 Serve warm or at room temperature with yogurt and fruit. Traditionally polenta cake is made with olive oil. Traditionally polenta cake is made with sugar. I guess I just broke two rules. 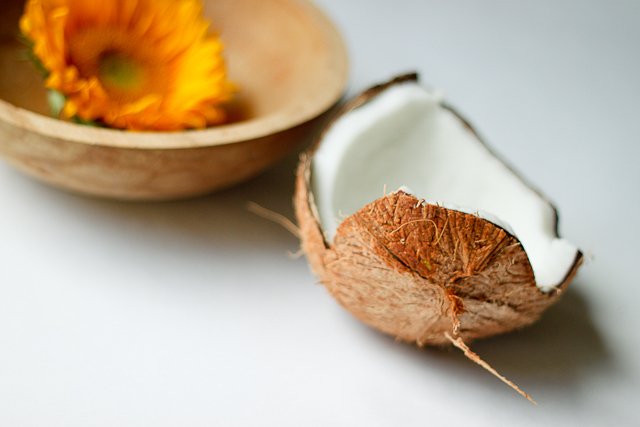 You can always substitute the butter for olive oil and you can substitute the coconut and orange juice for sugar. You could always make David Lebovitz's polenta cake recipe which has both butter and olive oil. 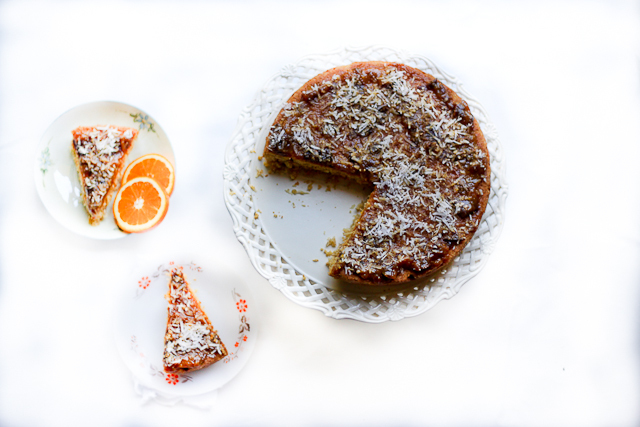 Or you could make the orange polenta cake from Gourmet that has caramelized oranges on top. And if you're gluten free or vegan or both you could make Scandi Foodie's pistachio polenta cake with figs. And/or you could come up with your own recipe. That's always an idea.